Sabelli, M. Rasner, J. Pérez Giffoni, C. Álvarez Pedrosian, E. (2013) «The information and Communication Strategies Focused on young people and adolescents within the field of Public Health». 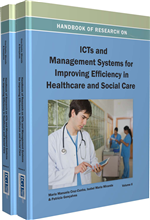 En Handbook of Research on ICTs and Management System for Improving Efficiency in Healthcare and Social Care. Vol. I‏, Cruz-Cunha, M. Miranda, I. Gonçalves, P. (eds. ), IGI Global, Hershey (Pennsylvania), pp. 247-267. Within the framework of the implementation of the Integrated National Healthcare System (SNIS) along with national policies of information and communication at the República Oriental del Uruguay, a research is being conducted, focusing on adolescents and young people in vulnerable contexts in the city of Montevideo, taking them as both real and potential users of healthcare information. It also centers in the mediators in the flow of communication and information, especially among healthcare staff. From a multi-interdisciplinary approach, this investigation aims at identifying the behaviors and needs of the target population in relation to the information and ICTs, the availability and access to personal technological resources, its context of use (the community, their everyday lives, the institutions), the process of interaction among the different social actors in the sector, as well as in the communication flow within the organizational culture of these services. On this basis, it will provide models to design electronic information resources according to the social needs, and which may contribute to the inclusion of all citizens in the so-called Information Society.